I had an interesting conversation last week with my Allstate agent. During the conversation, she asked me what I did for a living. “Search engine optimization and online marketing,” I replied. Privately, I wondered what type of work and what sort of results she was getting for $200 per month. A few days later, she sent me the report, which consisted of 5 screen shots – 1 for each of her keywords – in which her website was appearing on the first page of Google organic search for each of her target keywords. I verified that she was, in fact, ranking on page 1 for 4 of the 5 keywords. For the 5th keyword, she was on page two. When I see or hear of someone paying only $200 per month for SEO, it immediately makes me suspicious. I decided to do a little research to see if I could find out what her current SEO company was doing for her. The first place to look is to check out the links being created in order to rank the site. This is called “reverse engineering” or “spying” and is a practice often used to see what links your competitor has. 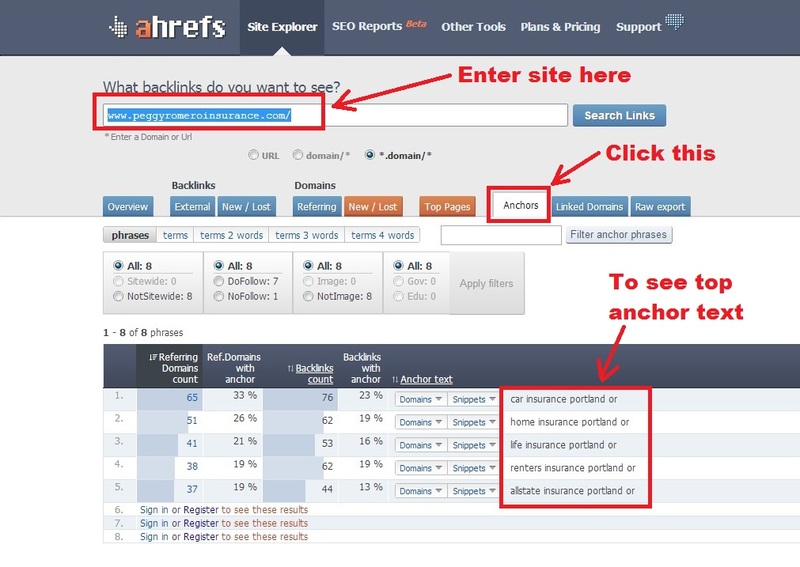 By typing a website URL into Ahrefs.com, you can see all kinds of data with regard to that site. What I was interested in was the sites that were linking to my Allstate agent’s website – since this is usually where cheap link building occurs. Seeing each of her five keywords (from the email above) with exact match anchor text raised a big red flag. It seemed pretty coincidental to me that the same 5 terms she wanted to rank for were the same 5 terms that all her links were built with. In a natural linking profile, we’d expect to see things like her website URL, her brand, her name, or terms like “click here”, “website”, or “check out my website”. So, I clicked on “Domains” to see a list of the websites where the actual links were being placed. One of the domains you can see in the list which I decided to check out is dontclickthis.org. (I’m not going to give these guys a link, but you can copy and paste dontclickthis.org into your browser if you want to follow along with my little excursion). Below is how their home page looked on March 18, 2013. Scrolling through the page, I can see it’s nothing but a bunch of random blog posts, each stuffed with a keyword link pointing to a different one of their client’s sites. Build My Rank (BMR) was a private network that included hundreds of blogs. By subscribing to the service – for as little as $59 / month – you could write a 150 word article, insert a link, and have the article published randomly on one of their blogs. Write a lot of articles with your anchor text included and you’d soon be ranking on the first page of Google for your target keyword. It was an easy system and it worked for a while. I know because I used it to rank my former SEO website; however, being that the links were essentially “paid links” it was a violation of Google’s quality guidelines. In March of 2012, Google took down BMR and wiped out the rankings of anyone who depended on it. I personally saw my website drop from #1 for a lucrative, traffic-driving keyword all the way down to page 4. My best source of lead generation was now dry and eventually I had to start over with this site, doing things the right way. 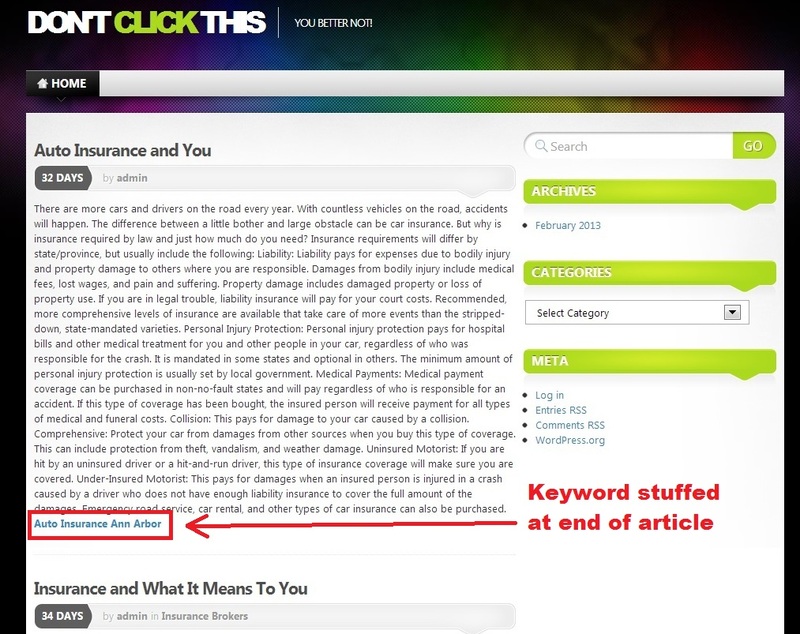 Take a look around dontclickthis.org and you’ll see that the entire site is full of articles with keywords stuffed either at the beginning or the end of the article. Unfortunately, when I searched for “car insurance portland or”, I couldn’t find the article for my Allstate agent. I’m certain it was there at one time and perhaps the site owner removed it or moved it, for whatever reason. Having checked out this first site, I was pretty sure it was a violation of Google’s terms of service because it is an attempt to manipulate their organic search results with unnatural links. (See screen shot below). 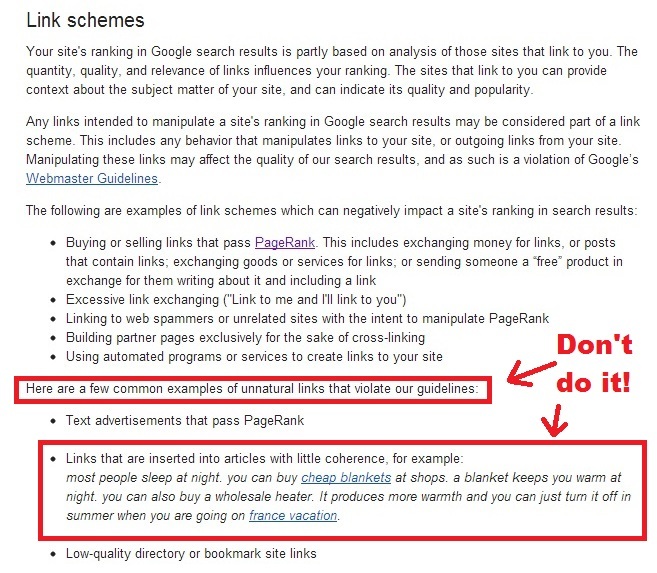 While the links that appear on dontclickthis.org are not quite as incoherent as the ones shown in Google’s example above, there is no doubt that they are in violation of Google’s guidelines. Taking a further look around dontclickthis.org, I found the article below which links to krillionology.com. 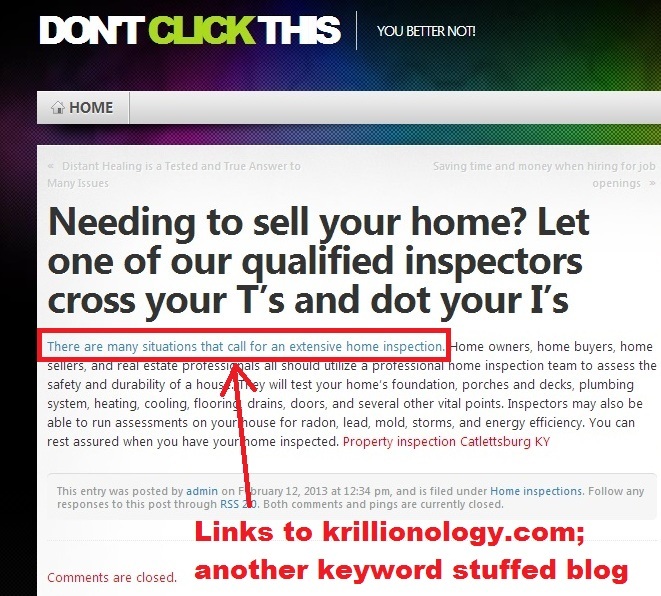 Being the investigator I am, of course, I visited krillionology.com’s home page, where I found more of the same generic articles, stuffed with keywords that violate Google’s unnatural links guidelines. By interlinking these garbage blogs (see ‘interlinking spammy blog’ links in image above), they boost the PageRank of one another, a strategy that helps each blog get stronger. While this helps the individual posts boost keywords in search results, it also is going to make it a lot easier for Google to detect and dismantle the network, once they discover it exists. When that happens, any business relying solely on this cheap SEO service for rankings can kiss them goodbye. For kicks, I pulled three phrases from an article at “krillionology.com/?p=3810” and searched for exact matches in Google. I wanted to see if the geniuses behind this entire link-building scheme were creating unique articles or not. Sure enough, they weren’t. You can check it yourself, just go to Google and copy and paste my search below. How likely do you think it is that there are 69 websites that all have these exact same 3 phrases, verbatim? We might see results like this if you wrote a press release that got picked up by 69 different news sites, but to see this much duplicate (or spun) content appearing on 69 different non-sensical blogs is clearly a form of spamming and is yet another violation of Google’s quality guidelines for scraped content. 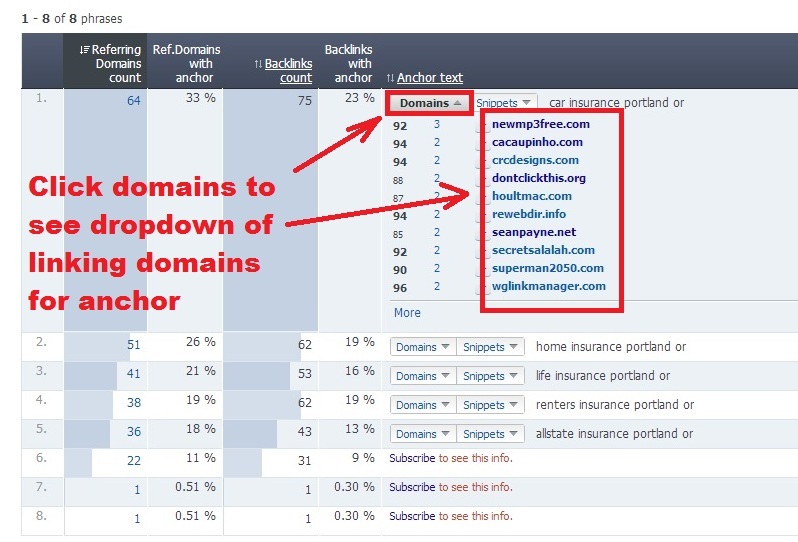 Whether you are intentionally or unintentionally using “black hat” methods like this private blog network to rank your site for your target keywords, the ramifications from Google can be throttling. When Google uncovers blog networks like these, they de-index all of the sites within the network, which means it is like the links you had on these sites never existed. As a result, your rankings will immediately fall away. 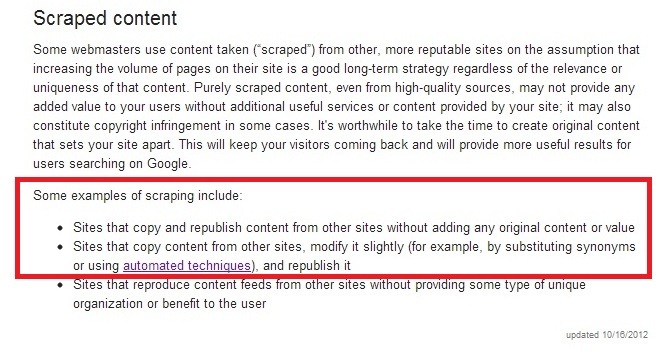 In more severe cases, Google may decide to levy a penalty on the sites that are paying to receive these links. And that means your site could virtually disappear from Google’s index and you can forget about generating many new leads from your website. Signs are that Google is getting even tougher about finding these blog networks, as evidenced by this article by Barry Schwartz at Searchengineland.com. In fact, it’s possible Google may have already uncovered a link network as recently as March of 2013. 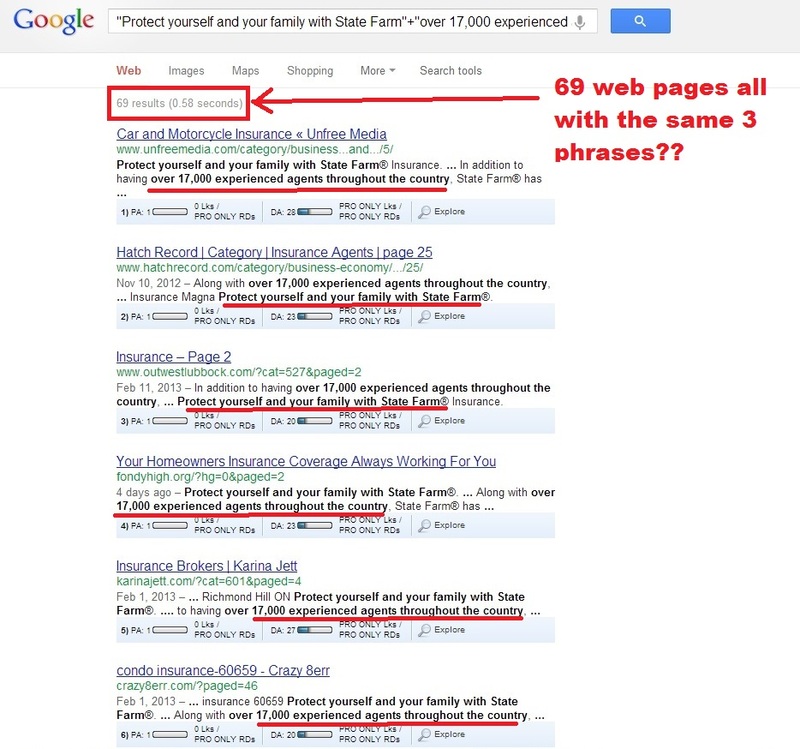 Here’s a screen shot of a Tweet from Matt Cutts – Google’s head of webspam. As you can see, Google is serious about taking down these networks. Put simply, you need to distance yourself from any sort of black hat link building that promises fast results for very little money. As discussed earlier, when Google discovers someone is trying to manipulate their search results, they take action. 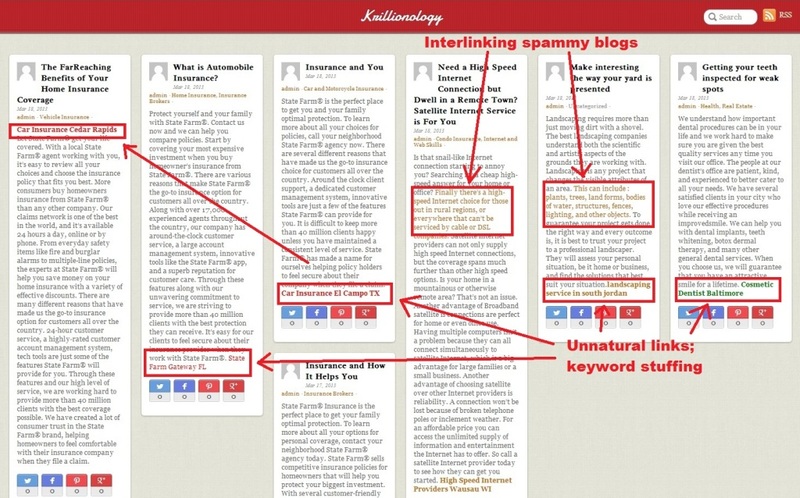 In the case of Build My Rank, they de-indexed all the blogs in the network, rendering any links on those sites useless. In January and February of 2012, I personally ranked #1 for “small business SEO”, a term that was driving hundreds of visitors and a number of good leads my way. When Google erased the links that had helped propel me to #1, one of my best lead sources was gone. Since a majority of my links were built using the BMR blog network, my website fell to page 4 for “small business SEO”. When Google rolled out its over-optimization penalty later in 2012, mikemunterseo.com fell out of the top 100 and never recovered. I had to start over with a new site. I learned the hard way not to take short cuts in order to rank my site. I also learned that doing quality SEO work and creating quality content is not cheap. It takes time and there is usually not a quick fix to getting more traffic to your website. 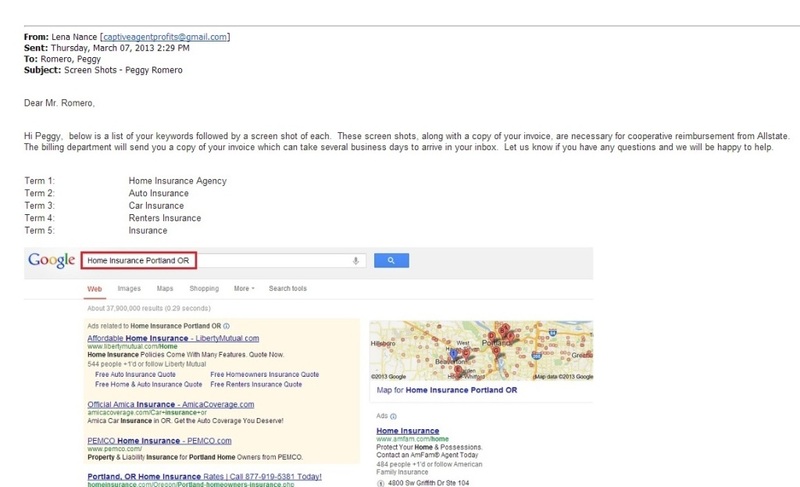 The interesting thing is that as of the writing of this post, my Allstate agent is on or near the first page of Google’s organic search results for each of her 5 target keywords. So are a few of the other businesses I looked at. The bad news is they probably won’t be for long. Black hat schemes like this often work for a while, but after they get sniffed out by Google, the sites in the network get de-indexed and the links no longer count. Any rankings achieved are gone and sometimes those sites receive a penalty. Who’s Behind This Cheap SEO Service? I wondered who set this network up. I spent 10-15 minutes browsing around and found there are literally hundreds of these random blogs that have been setup for the purpose of manipulating Google’s organic search results. It must have taken a decent amount of money to set this whole thing up, considering the cost of domain names, hosting, web design (albeit very basic), and whatever time is necessary to inject keywords into duplicate articles and post them. I wondered if there was a pattern to who was behind the blog network, but checking the Whois information for several of the sites turned up the same owner: DomainsByProxy, which is a private domain registration service that keeps your contact details confidential. Shocker. If I was up to ‘no good’, I guess I’d hide my contact information, too. Of course, there are other ways of finding out who is behind it and I have a pretty good idea who it is, but I’m not going to mention them here, in case I’m wrong. There’s enough data here for the proper authorities (Google/Bing) to do their own research and take appropriate action. Notice how the service just got reduced from $200/mo to $120/mo! There is NO WAY to get quality SEO and online marketing services for $120/mo. Me: Hi, I’m calling on behalf of my Allstate agent, Peggy Romero. I do SEO and online marketing for her and I’m calling to request a report of all your link building activities for her. Them: Um, this is not something we can provide. Me: Well, here’s the problem. It looks to me like your company is creating links that are in violation of Google’s guidelines and I’m concerned she might lose her rankings and get penalized. Them: She is actually ranking pretty well for her keywords. Me: I can see that; however, when Google finds out about the network you’re using, she will lose her rankings. That is why I’m wondering if there is a report that shows any additional links you may be building? Them: Umm, well, we make sure she’s up to date in directories. Them: That information is proprietary. What a load of BS. Any company who won’t provide you with a report of where they are obtaining your links is covering something up. I asked to speak with this gentleman’s manager and was summarily dismissed as they said once again that their link building system is “proprietary”. Now that the cat is out of the bag on these guys, Peggy and I are in the process of notifying Allstate corporate about the scheme, so any agents using the service can become informed. What about my Allstate Agent and all the other business owners who are innocently using these services to rank their website? Should I “out” this network and expose the individuals who set up a business gaming Google’s search results for personal profit? Let’s talk about the second point first. Certainly, whoever is behind this blog network has invested significant time and money to setup a way to deliver results to their clients for a cheap monthly fee. Kudos to them. But herein lies the rub: They’re cheating. Cheap services like the one described here contribute to the confusion many business owners have about the SEO industry. To some, the mere mention of the term “SEO” causes them to raise a suspicious eyebrow and wonder what we’re up to. Often, this results in firms like mine losing business. SEO is a relatively young industry and although it’s beginning to move out of its “wild, wild west” stage, there are still ways to game Google’s search results using shady link building techniques. The problem is that these schemes and strategies are short-lived. Investing in cheap SEO services may yield some nice rankings in the short term, but once they are discovered, those rankings are gone forever. As detailed in this excellent video by Cyrus Shepard, Google is getting better and better at fine tuning its algorithm to reward businesses that play by their rules and gain links naturally. If you’re considering SEO services, make sure you find out exactly what you’re getting. Ask for examples of their link building techniques. See if you can talk to a current client they’ve been working with for at least 12 months. Simply asking these questions can help you weed out some of the SEO services firms you’re better off not doing business with. Now, back to my first moral dilemma. By writing this post, I expose a service that innocent business owners like Peggy have hired to help them market their business online. I asked my agent for a report on her current SEO company and she provided it. I’m pretty sure she didn’t know it was going to cause such a mess, including possibly losing her rankings and risking penalty to her site. If you’ve been victimized by a service like this, I’m sorry. Honestly, Google would’ve found out one way or another. At least now you know and you can take appropriate action. Hopefully, Google will consider your intentions as they take action on the owners behind this scheme. Hopefully your individual sites won’t be penalized. If you’ve been using a cheap blog network that builds links like the ones I’ve described here, I would recommend to cancel immediately. You might also consider asking for a full link report, although I doubt you will receive it. You may also consider asking the service to remove all of the links they have built for you. *The risk/reward in doing this is that you will lose whatever current rankings you have; however, you will get out in front of any potential penalties Google may or may not decide to inflict upon your site. For what it’s worth, Peggy has signed on to become my newest client. I’ll be helping her launch an effective email marketing campaign. We’ll be claiming and optimizing her Google Places listing, to help her appear in local search results for her keywords, and she plans to begin blogging to attract organic Google traffic to her site. We don’t expect results overnight, but the nice thing is that the links she gains by producing quality content will be hers to keep. Google will love them because they will be natural. If you’d like to get educated about what white-hat search engine optimization and online marketing entails, there are some great resources below. Start by watching this short video from Google’s Matt Cutts that shows how search works. There are a couple things we can learn from this experience. One is that getting links from a diverse group of blogs is an effective method for ranking your website in Google. As SEO’s, we already knew this, but this example highlights its effectivness. Using guest blog posting with varied anchor text is an ethical “white-hat” way of achieving similar results. Of course, it’s going to take you more time and cost you more money, but your results will be long lasting. The other thing we know is that underground blog networks still exist. They are the foundation of cheap SEO services and are only a short term solution. I know for a fact the creators of Build My Rank started a new service and I’m sure when Google finds out about it, they’ll take it down. Any attempt to manipulate Google’s organic search results may give you short-term results, but if you’re building your business for the long-term, you’re probably best to avoid them. Know what you’re getting into before you invest and choose carefully. If you have any questions, feel free to comment below or contact me. If you want to invest in your website and marketing your business in Google ethically, check out our Affordable SEO packages.